With a big increase in wine fanatics and collectors, wine storage facilities are popping up all over the place. Avid collectors are collecting so much wine that they are running out of room in their homes to store them correctly, and are turning to wine storage facilities to store it safely for them. In addition, wine collectors realize the importance of their collections being stored in the proper environment. Wine storage facilities can provide the correct environment. What is a Wine Storage Facility? A wine storage facility is a large facility, usually a warehouse that houses wines for collectors. They are experts at storing wine and ensure that the environment is perfect for wine storage. The facility controls the temperature and the humidity level at the recommended levels for wine storage. The customers have access to their wine just like you would have access to items you store in other storage units. How do I Find a Wine Storage Facility? The internet is a great place to locate the closest wine storage facility. You can Google search wine storage facilities and your location to see if there is a facility near you. Once you get a listing of wine storage facilities, visit their websites for more information. Before settling for a facility, do an on-site tour to make sure that the facility provides the proper environment and security for your collection. The perfect conditions for storing wine is a temperature maintained at 55 degrees F, and a humidity level at 70 percent. The temperature must be 55 degrees F in order for the wine to develop and mature at a slower rate. If the wine is stored at a warmer level, the wine will mature too quickly. The humidity level should be 70 percent, if the humidity is too high, it will cause mildew and mold that will damage the wine label. If the humidity is too low, then the wine cork can dry out and possible break the wine’s seal. If the seal on the bottle is broken, the wine can spoil. What Should I Look for in Wine Storage Facilities? Wine storage facilities should maintain the proper temperature and humidity level, and the facility should have backup power in case of a power loss. You want to make sure that the wine storage facilities have separate storage lockers for each customer. Some facilities will store the wine all together. Security is a must, make sure that there is an on site security guard to prevent your valuable wine collection from being stolen or damaged. You will want to check to see if insurance is included in the pricing or if that is an additional fee. Check and see if your will have access to your collection 24 hours a day and 7 days a week. Why is it Important to let my Wine Age? With some wines, the fruits are harvested at their peak and will develop more intense flavors after storing it for many years. It takes time for some wines to mature and develop. 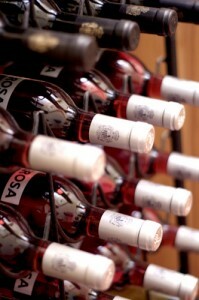 Depending on the particular wine you are storing determines the amount of time that is needed for the wine to mature. Most wines are meant to drink after a year or two of aging, but there are wines that can be aged for many years. The longer they age, the better the flavor and drinkability. Why do People Collect Wine? There are many reasons people collect wine. Some just love to drink wine and enjoy aging it to perfection for the flavor. Some have turned wine collecting into a hobby and just enjoy the thrill of finding a great bottle of wine. And some like to collect wine for the investment. The temperature should be 55 degrees F and the humidity at 70 percent. Don’t let the temperature fluctuate. Store the bottles on their sides. By storing the wine on its side you will keep the cork moist which will prevent the cork from drying out. Wines do not like bright light so store the wine in a dark place. Wine tends to be a bit picky. If you feel that you can’t provide the perfect conditions for your wine to age and mature properly, you should consider wine storage facilities. Your investment in your wine collection is valuable to you, and you don’t want to risk losing that investment. Leave the wine storage to the professionals.